Have you ever made your own fabric? Maybe you've experimented with block printing, dying or digital design? Lots of us who develop a fabric affection become interested in the creation of fabric itself. Perhaps you've even dreamed of selling your wares? Today let's hear from someone who started like many of us and ended up with a thriving Etsy shop. I've asked Rachel Switzer of Cape Cod Shibori to share how she became a fabric artisan. What sparked your interest in creating fabric? I’ve loved pattern and color since I can remember, and I enjoy various textile processes. I did some sewing, embroidery, quilting and weaving in my teens. I tried batik and dyeing with friends in my 20’s. While my kids were young, I wove at home for Randall Darwall. I wove his hand dyed, very fine, silk fibers into shawls, scarves and yardage. Occasionally, I made a little time for portable projects like rug hooking, and knitting. 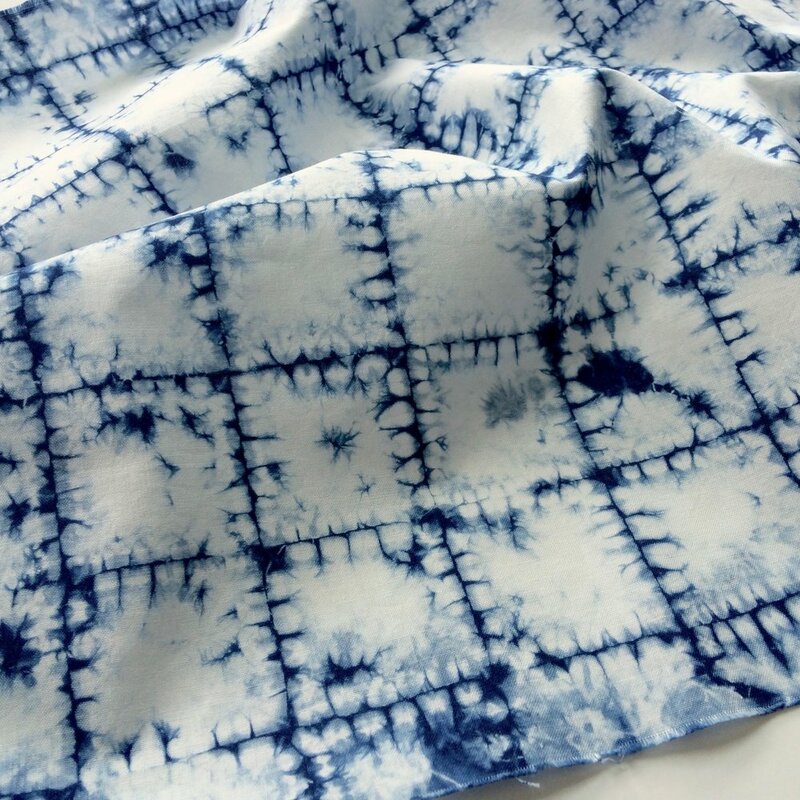 It wasn’t until I became an empty nester, that I found the time I needed to learn the Japanese resist technique "Shibori." How did you get started? Did you take a class, read a book, learn from a friend or even learn online? I fell in love with Shibori when I saw the pattern ‘White Shadow’. I love the beautiful markings and the low volume appearance. It is a time consuming labor of love, since after hand stitching and dyeing, all the stitches are removed to reveal the pattern. The fact that it involved hand stitching and dyeing, convinced me that I had to try it. I found a Shibori artist who had a studio 45 minutes away. Once a week she guided me through the basics. She helped me decipher instructions in Yoshika Wada’s book ‘Shibori: The Inventive Art of Japanese Shaped Resist Dyeing’. From there, I experimented at home. A lot. I watched videos, read books, and took the occasional workshop. I tried to recreate the patterns I saw in books and online. I experimented and tried new patterns. I didn’t really know for what end, but I loved the process. What took you to the next level? How did this grow into a business? At some point I realized I was amassing fabric, and I wanted to have a reason to keep going. So in 2013 I opened my Etsy shop. I hoped at least to cover the cost of fabric and dye. The shop has exceeded my expectations. I think my shop is unique in that I supply Shibori for makers, as opposed to finished wearable or home décor items. 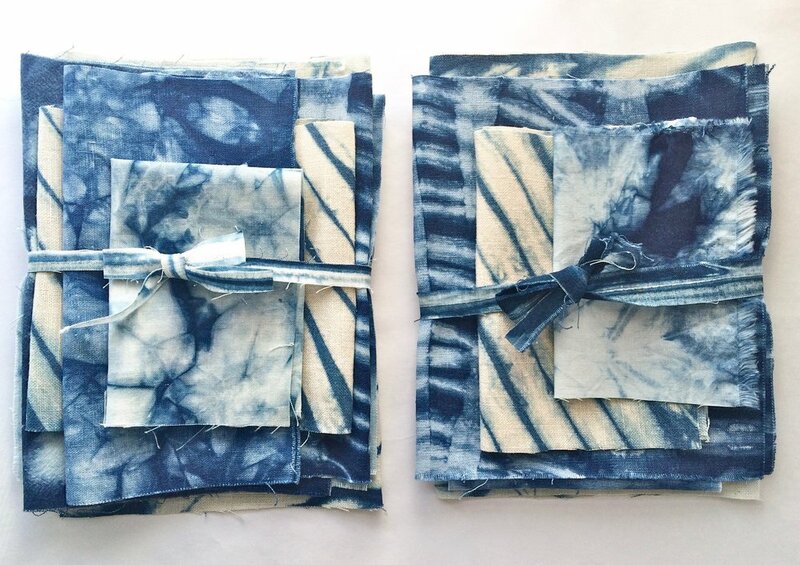 In addition to cotton Shibori, I offer denim and linen shibori bundles. I see a trend now towards Boro style and visible mending projects. These denim and linen bundles supply the variety needed all in one purchase. What is it like running your shop now? Any employees? What do you do to promote your business? I love having the Etsy shop. I’m proud of how it looks and that my fabrics have been well received. I had a steep learning curve at first. Until then I hadn’t spent a lot of time on the computer. But I learned to edit photographs, as well as use Pinterest, a Facebook business page, and Instagram to promote my shop and gain a web presence. I don’t have any employees, however my daughter created a website for Cape Cod Shibori, and my husband is my go-to tech guy. I’m lucky in that I enjoy all the chores associated with my shop. Dyeing fabric, ironing, creating pleasing bundles, photography, social media and even shipping. I take pride in sending a nice product to a customer. What's next for you, artistically? I recently took a beginning surface design class on line. As I said earlier, I love color and pattern and I’ve had a dream to design fabric for a fabric company. Now that I have some familiarity with Adobe Illustrator, I plan on designing digital repeat prints. I don’t know where this will lead, but I’d love to see some of these designs printed on fabric some day. I plan on creating digital design, while dyeing fabric for my Etsy shop. They are very different processes and I enjoy both. Thank you, Rachel. Your story shares a common thread with many creative businesses. So often we start creating for the love of it and meander into creating for income by way of covering those craft supplies! A successful creative business always starts with passion for creating itself. And that's something we all have in common, readers and bloggers and sewers and quilters alike. 2. Comment on this Instagram photo. To be eligible for the Instagram entry, you must follow StitchedinColor and CapeCodShibori on Instagram. 3. Comment on this Facebook post. 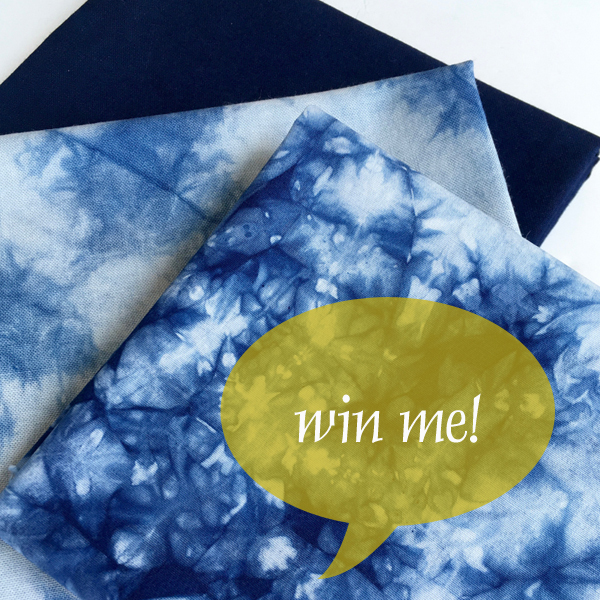 To be eligible for the Facebook entry, you must follow Cape Cod Shibori on Facebook. Or do all three to increase your chance of winning! Enter now through noon EST on April 18th. This giveaway is now closed. Congrats to BeckyJoy, an Instagram entry. She was our lucky winner!